Have your say in what we play!! 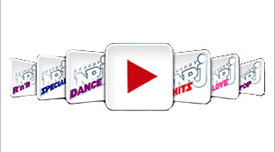 If you're a music enthusiast, love Pop & Rock & R&B & Dance and would like to get involved, just email us on NRJ100@nrjlebanon.com to join the lucky few listeners who will get the chance to choose what songs we play on NRJ. We need 3 hours of your time once per month. First Meeting in MTV/NRJ Building on February 15th starting 4pm. The NRJ100, one hundred lucky listeners, one great radio station.